At times life can seem all about maintenance. You maintain a healthy smile by going to routine dental appointments. You maintain your car by keeping up with your oil changes and recommended servicing. But when is the last time you performed maintenance on your office chair? It may sound silly, but if you want to get the most out of your chair, you have to give it a little tender, loving care. Why do I have to perform maintenance on my chair? Your office chair puts up with a lot of wear and tear. The continuous weight it holds, and movement it endures, can cause things to loosen. Plus it can accumulate dirt and other grime from sitting in your office day in and day out which may interfere with how well your chair actually works. You can definitely care for chair whenever you feel like it may need a few tweaks, but in general it is suggested you perform routine maintenance about every 6 months. You may even get a notice like this with when you first get your furniture that lets you know when maintenance should be performed on that particular piece. You’ll want to write down when you performed maintenance and then schedule out 6 months, whether in your calendar or via an alert on your phone, so you know when it’s time to give your chair a once-over again. Cleaning may be required on a more frequent basis, which we will go over a little later in this post. You chair needs to be cleaned on a regular basis. Whether your chair is fabric, plastic, vinyl, mesh or leather, a good weekly vacuuming will help get rid of the dirt, dust and grime that can accumulate on your furniture. Just make sure to choose a vacuum attachment that won’t scratch or damage your chair, and keep the amount of suction as low as possible too, so you don’t leave any lasting marks. You can also wipe down your leather and vinyl upholstery, plastic, chair arms and bases with a clean cloth on a weekly basis. Even with routine upkeep there are times your office chair may need a deeper clean. The method to do this will depend on your upholstery. 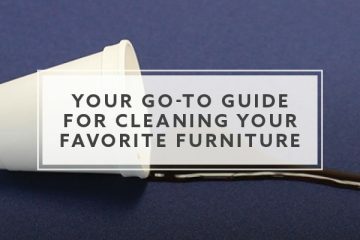 We have each of the cleaning methods broken down step by step for you in our “Go-To Guide for Cleaning Your Favorite Furniture.” You can access these steps and demonstration videos by clicking here. The most important thing you can do is to clean any spills or stains as soon as you notice them. While you’re cleaning, you’ll definitely want to spend a little time on your casters too. Each day the wheels of your chair encounter dust, the dirt from your shoes, the hair and fuzz in the carpet, and anything else they may come in contact with (like the crumbs from your lunch?). All of that mess builds up over time or gets caught in your casters, making your chair more difficult to move. When this happens you will need to flip your chair over and get out the grime. The first thing you’ll want to do is pull out any visible clumps of hair or dirt (if this really grosses you out you can always wear gloves!). Then you can either vacuum the casters using the appropriate attachment or blow out any dirt using compressed air. When the casters are crud free, you may want to give them a quick spray with a lubricant (such as WD40) to make sure they’ll keep rolling as smoothly as possible. You will want to thoroughly go over your chair to make sure every screw and bolt is tightened, including any screws holding the arms, seat and back, as well as any in the chair’s mechanisms. 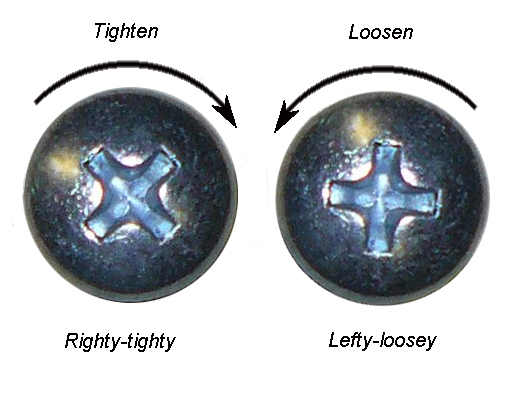 To tighten the screws, simply turn them clockwise using the same tools you used during assembly (during times like these the “righty tighty, lefty loosey” saying comes in handy!). When doing this be careful not to tighten the screw s too much because the last thing you want to do is strip them, making further adjustment difficult if not impossible without replacing the screw entirely. You may want to keep your assembly instructions so you can pick up a few back up pieces for your furniture during your next trip to the hardware store. That way if you would need a new screw, bolt, or other part in the future, you’ll already have them on hand. Suffering from a sinking chair? If you have tightened all of the screws and bolts and still can’t get your chair to stay in place, it may be time to replace your cylinder. Gas cylinders are often the first thing to go out on office chairs. When this happens you will need to decide if you would like to pay to replace the cylinder or would rather just purchase a new chair. Since you will be working with different chair parts and a pressurized gas cylinder, you will want to make sure to wear eye protection. 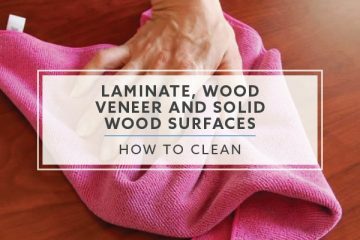 Lay down a tarp or newspapers to protect the area in which you will be working if you do not want to risk leaving grease stains or scratches on your work surface. Turn over your chair to remove the cylinder. Remove it from the chair by twisting it until it comes free along with the chair base. To help loosen it you may need to use a pipe wrench or spray it with some aerosol lubricant. Once you have removed the cylinder and base, turn the base over and knock out the old cylinder by hitting the end of it with a rubber mallet. Next, insert a new cylinder into the base of your chair. Then stand up your chair and connect it to the new cylinder and base. Sit in your chair and make sure it responds properly and then adjust it to your desired height (and this time it will stay in place!). 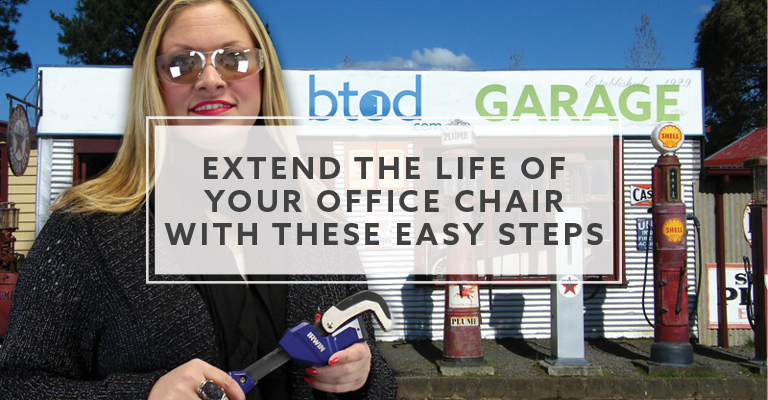 By following these simple steps for routine maintenance you can make sure your office chair will look better, work better and last longer, and you will be getting the maximum return on your investment. You may hear or read that certain chairs do not need any maintenance, but why risk it when you can have maintenance done in minutes? What type of maintenance do you perform on your office chair? Do you have any tips or tricks to keep our chairs looking their best? What was the hardest thing you ever needed to clean off of your chair? Share your experiences with us in the comments section below! Greg Knighton is the President of BTOD.com with over 15 years experience in the office furniture industry. When he is not at the office helping customers he enjoys golfing, skiing, snowmobiling and spending time with his family.